the actual event only happens on the last 10 minutes. 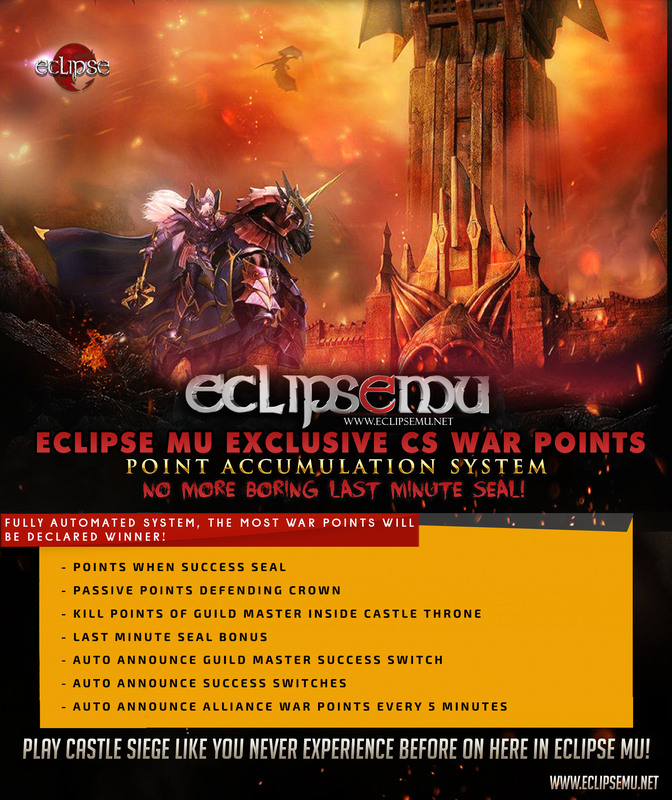 We are changing that with our new Castle Siege War Point System. rather then the one who sealed last. So NO MORE BORING LAST MINUTE SEAL! ** The Castle Owner (defender) will have an initial of 10 points. ** Each successful sealing will award 25 points to the alliance. ** Killing the main Guild Master of the defending alliance by the opposing NON-GM member inside the throne will award 1 point to the alliance. ** Killing the main Guild Master of the defending alliance by any Guild Master of opposing alliance inside the throne will award 3 points to the alliance. ** Killing the main Guild Master of the attacking alliance by any NON-GM member of the defending alliance inside the throne will award 1 point to the alliance. ** Killing the main Guild Master of the attacking alliance by any Guild Master of the defending alliance inside the throne will award 3 points to the alliance. ** Killing the main Guild Master of the attacking alliance by any member of another attacking alliance will not award you point. ** Defender will get 2 points every 3 minutes. The 3 minutes defending rule will also apply to every alliance who will seal the crown. ** The alliance who will seal last will get a bonus of 15 points. The alliance points will be shown every 5 minutes. This is a new designed mechanics for points system, we will apply changes to improve the system.